In whatever ways we spend our days, whether in business, science, trade, academia or art, humans have in common the innate drive to seek innovation, creativity, originality—in a word, inspiration. We take input from our spheres—family, friends, community, nature, news, advertising and physical surroundings—to solve problems and create our best output, whether for income or avocation. Inspiration may be found in a garden view or landscape, a piece of art, a magazine ad or interesting article of clothing. Trends in fashion, home décor, media and art are interconnected and impact one another, pushing culture forward in a whirl of creative energy. Colors provoke emotions, associations and reactions that affect how our brain perceives things. More than 16 million colors and hues define our world and have the power to impact emotion, bringing on feelings of calm, energy, anger, happiness and nostalgia. Interior design directly affects our mood, outlook and productivity. Real estate professionals, like interior designers, are often inspired by spaces in their own homes, drawing from their surroundings creativity that translates into delivering their personal best service as advisors and agents for their clients and customers. 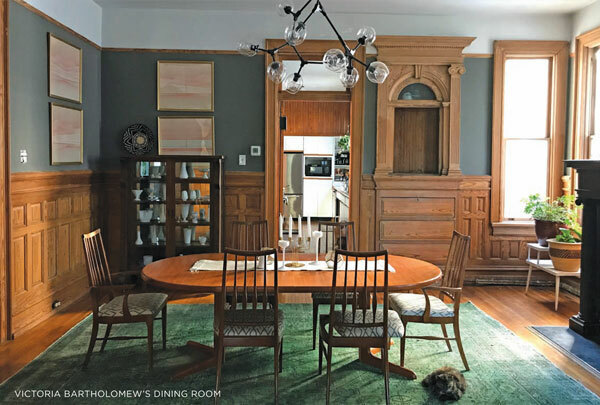 Her favorite creative space is her renovated dining room with its dark, saturated color. Victoria says that dark colors make her feel alive and invigorated. Line prints hanging on the wall are perspective charts from her grandfather’s time in architecture school. The mid-century modern dining room set was purchased through an open house she happened upon as an agent; she asked the owner’s aunt if he had any interest in parting with some of the mid-century furniture before he moved; fast forward to closing— he sold every piece of his collection to her, a win-win for both parties. Stevie Savage, a realtor with John Stewart Walker for over 30 years, is at her most creative in the family’s den. With a creamcolored sofa and two club chairs, there is ample room for friends and family to gather and even kick up their feet on the cushy ottoman. Streams of natural light pour into the room through the bay window that overlooks the deck; the walls are lined with books chock full of design ideas and family mementos. Texture is found in the throw pillows and jute rug. Stevie comments, “Cozy spaces inspire me to think of the finer moments in life and consequently, what might be a good fit for my clients.” Stevie values her time with her family; her den is truly a haven for warm and wonderful gatherings. Mary Morrison Sloan, a realtor with John Stewart Walker, draws inspiration for her clients from her three young boys. She says, “When I stare at the backpacks, sports equipment and musical instruments of my three sons, it reminds me that I need to focus on the busy and sometimes hectic home lives of my clients; I make sure that prospective properties are able to accommodate their current and future needs. Moms appreciate storage space and this mom knows the value of built-in storage!” Seeing the dayto- day items of her young family allows her mind to bloom and dream about how she can help other families as well. 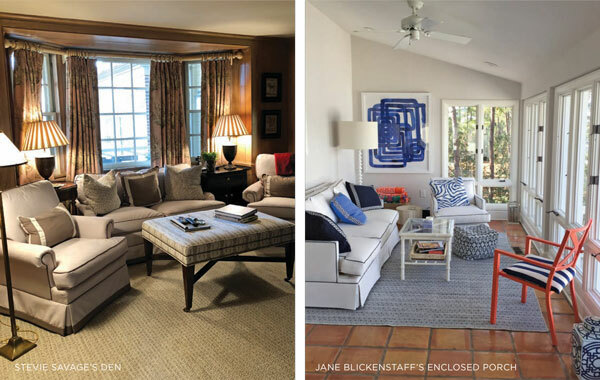 Jane Blickenstaff, with Blickenstaff & Company Realtors, has a bachelor’s degree in interior design from Purdue University and an eye for architectural elegance. Being in the business for over 35 years, she can envision and articulate the potential in properties and thus help clients in a wide array of areas. In her own home, the successful broker has found that updating her kitchen and dining room has really stretched her creative mind. She has replaced outdated chandeliers with bold and modern, large scale lighting. She has changed out her traditional wooden dining room chairs for cloth covered ones. It makes dining cozier and ups the “wow factor” in her sophisticated space. “Lighting, kitchen design and overall great spaces help me to help my clients picture homes that they want to buy,” says Blickenstaff. In her lake house, one room in particular really sings to Blickenstaff. She loves the enclosed porch that overlooks the lake in the back of the house. Drawing on her love of blue and white and preference for clean lines, Jane added pops of coral to add interest in the white room. Graphic modern art, ginger jars and bamboo furniture round out the rooms appeal. In this space, Jane can relax and let herself be inspired by her surroundings, both inside and out.